I picked this up at Naples airport on my way back from Italy. 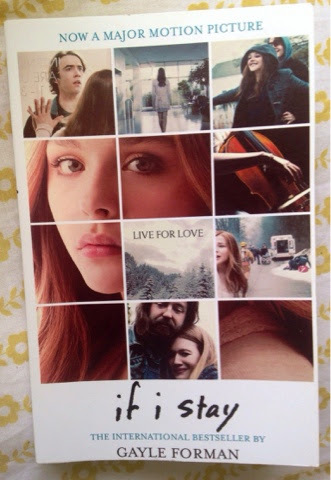 I was limited to the small selection of English books they had and this one called out to me- mainly because it has obviously been made into a film and I love to compare book to film adaptations! It is hard to write about this book without including spoilers so I have split the review into two parts. The first half is spoiler free but don't read the second half if you have yet to read the book! Mia is a 17 year old with everything to live for- a brilliant family, a boyfriend who shares her love for music and an amazing best friend. But then she is involved in an accident and suddenly she's not sure what she has left to live for. The book follows Mia as she attempts to decide whether or not she should stay. The book has a good if not a bit predictable story line, to me it was nothing exceptional but neither was it awful. I loved the music references and I really felt asthough the characters had a genuine love for music. I thought all of the characters were good but none of them were developed as much as I would have liked, most likely because the book was quite short. It's not so much that I didn't like the book, I just didn't think it was amazing. I wouldn't actively recommend it to anyone but nor would I discourage someone from reading it. It was a quick and easy read and from reading other reviews I know it is a well loved book. Can you control your death? This question seems to dominate the book. Mia is a teen with her life ahead of her, one quarter of a happy family, girl friend to punk rocker Adam and best friend to budding photographer Kim. Everything is just as it should be, with prospects of Julliard on the horizon, her future is bright. Cue car crash. Mum dead, dad dead, brother dead. Just like that. A bit predictable, but heartbreaking none the less. The accident was a bit too expected for my liking, what else is going to happen when a family decide to go for a drive just after snow has settled. I always look for the shock factor and sadly this book did not have it. The disappointing start aside, I actually quite enjoyed the book, the rest of the book followed Mia as she had an out of body experience, allowing her to view herself in intensive care, watch her friends and family suffer and give the reader an insight into her life. I liked the narrative voice and I warmed to Mia as well as the other characters that featured in the story. I did however feel that the characters fell short in a number of ways, I couldn't quite picture Mia in my head and I didn't feel asthough I had enough time to get to know Adam, Kim and Mia's family either. Maybe a 100 or so extra pages would have done the job. Despite all of this, it still managed to tug at my heart strings and there were many points where I couldn't contain the tears. It was good enough to prompt me to order the sequel but I wouldn't reread it and nor will I be shouting from the rooftops about it.